Last edited by Joe Moore; 02-28-2018 at 11:30 AM.. I wouldn't be surprised if it was in development before Ragnarok came out and they didn't have time to change it. Promotional pictures of Thor from packaging has him looking like this figure in the...erm...face. Perhaps something is fixed in the film? Perhaps it's a spoiler that it's back? Also, is this the first good look we've gotten at Jarnbjorn? He's not the God of Hammers. He's the God of Thunder. Although in the movie he wielded the power of lightning, which mean he's really the God of Lightning. Because the power of "Thunder" - making a loud boom - is pretty useless. Maybe he's also the God of Eye Regrow. Thor’s face looks… not good. Hopefully it’s just a bad prototype or a placeholder to avoid spoilers. Or possibly he ends up healed in the movie. Is Cull Obsidian supposed to be a comic version, because he is not wearing the movie costume and looks pretty faithful to the page. Strange to have MCU Proxima and comic Black Dwarf/Cull Obsidian. I'm hoping that the Thor in the Groot Rocket 3-pack doesn't have the cape. Bare arms would be nice too. They really nailed the ScarJo head IMHO. I'm really excited for this movie and all the toys but if these are the definitive character designs I'm disappointed. I understand Cap and Widow are fugitives (and here they really look like it) but their costumes just don't resonate "superhero action figure" for me. Easy pass. Wasp looks cool though. Can't wait to see King Cobra on the big screen! I already have Taskmaster. The figure is unbelievably awesome and destroys the old Toy Biz version. He's not in the movie. Hasbro always sticks in a few comic-based characters into their movie waves. Last edited by Dolemite; 02-28-2018 at 10:08 AM.. It's going to be really easy to pass on most of these. I've seen the new Cap in person and I think he just looks awful, Iron Man isn't different enough to warrant a purchase, I'm fairly certain Iron Spidey will see a reissue with mechanical arms making this version obsolete, Black Widow is unrecognizable even if this is supposed to be a nod to the Yelena Belova version from the comics and Thor and Thanos just look whack. I'm only really interested in Taskmaster, Malaketh, Ant-Man & Wasp. Last edited by OGTrilogy; 02-28-2018 at 08:24 PM..
Definitely getting black widow she looks Incredible! But I can’t really tell if Black Dwarf is the Mcu one or not. 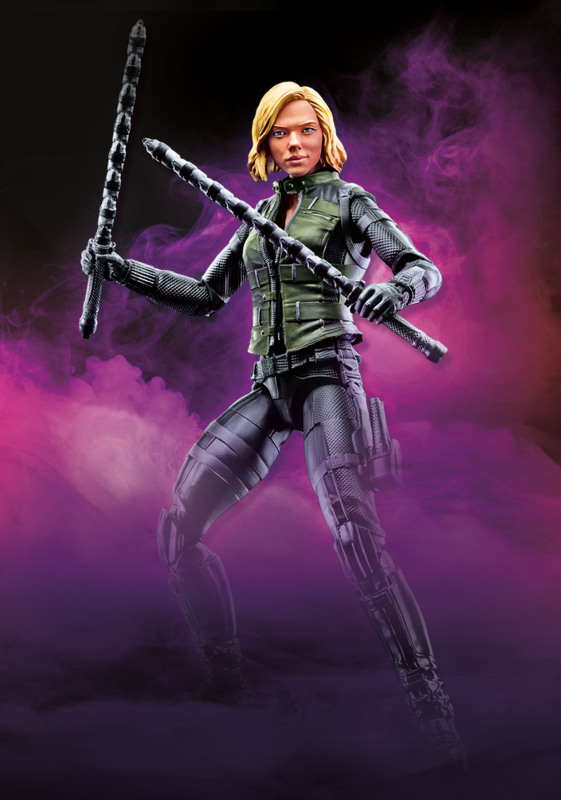 If you look very closely, it does appear that Black Widow's green vest is a separate piece that can be removed. I didn't like the new Cap initially, but the body sculpt is entirely new, and it has become my favorite MCU version of Cap yet. The problem with the headsculpt, (besides that super pronounced tuft in the front) is that the final product has a completely different hair color from the one in the promo image (as well as the film). I touched it and the beard up with some paint to get it the proper color, and it made a world of difference. I'm only really interested in Taskmaster, Malaketh, Ant-Man & Wasp. Know that there is also an Ant-Man & Wasp two pack being released. I think with the Stan Lee BAF. I'm so goddamn here for that Thor. I'm glad he's wearing a cape and the chainmail, I was hoping they'd make an appearance in the film after that photoshoot. I'm not too psyched about his eye being back, I hope it's just a goof and not actually part of the movie. But yeah, I can't wait to have that Thor in my hands. MCU Ghost is getting snubbed. Cull Obsidian's hammer is made of LEGO. Does anyone know if there will be 3.75 inch, articulated, figures for Infinity War? Yeah, that Thor looks sad in the face. With a side of extra sadness. That Widow though... I'ma have to get a few of those. It's non-descript enough that you can use it as your generic female-merc types. Just gotta swap in some faces. Oh, I knew there was a 2-pack with Ant-Man and Yellowjacket, but I didn't realize there was an Ant-Man and Wasp 2-pack coming as well. I guess I'll just pick up which ever one I find first. I know most people are excited about Yellowjacket and a lot of the old/dead MCU characters finally getting figure treatment, but to me it seems like hasbro waited so long that many of the characters aren't relevant anymore and I've lost my interest in them. Maybe that will change once I see them in person though.